There’s no doubt about it, blogging is huge. But don’t take my word for it, let’s look at the numbers. On blogging platform WordPress there are almost seventy million blogs, which are read by 360 million people each month. There’s even more blogs on the Tumblr (over 100 million as of April 2013) and Livejournal platforms (approximately 62 million blog sites as of April 2013). While blogging may not hug the headlines as much as social media, the online writing format continues to grow. By the end of 2011, NM Incite, a Nielsen/McKinsey company, was tracking over 181 million blogs worldwide, compared to only 36 million in 2006. Similarly, blogging has become one of the most popular tools among corporations in a number of geographies. Research by the Center for Marketing Research at the University of Massachusetts has pointed to growth across both the Fortune 500 and the Inc. 500 in 2012. Forty-four percent of Inc. 500 companies, the fastest publicly-firms in America, were blogging, while twenty-eight percent of America’s largest publicly-listed firms had a corporate blog. The most interesting statistic was that sixty-three percent of CEOs of companies who did blog contributed personally to content. It’s fair to say that the Middle East corporate world, and the Gulf in particular, doesn’t share this same level of enthusiasm for blogging. Few publicly-listed companies have a blog – we’re literally talking a handful – and even those blogs that are online are rarely updated. While it’s hard to speculate on the reasons why so few CEOs blog here, the one assumption that I’d make is either they don’t feel a need to communicate with their stakeholders or they don’t want to reveal information through a medium such as a blog (this subject does need more research, but the lack of blogging here maybe reflects a wider lack of understanding of digital communications). For a pastime that was once considered on the fringe of journalism, blogging is a pivotal online media channel for breaking news, sharing content and developing an audience. Blogs are often quoted in the media and it allows a corporation to control the message and yet promote a healthy dialogue with its internal and external stakeholders. There are many reasons for starting a corporate blog, but we’re going to focus on the five basics which should underline to your chief executive officer the value in having a blog for your company and including blogging as part of our communications strategy. We all want and sometimes need more information, and yet corporations often keep too much of a lid on what external stakeholders see and know. A blog allows you to let others look inside the company and give them a better understanding of any and every issue you care to tackle, from sustainability to product development and customer relations. The benefit of transparency is increased trust. Your (potential) customer base should better understand why you do what you do. Customers and investors will feel much better informed and they may be more willing to buy your product and invest in your company. However, don’t take transparency to mean republishing your press releases in a different format. Some of the most successful corporate blogs are those that take a nuanced approach, that tackle the good and the bad. The less biased you are, the more likely you are to be trusted when publishing a blog. Corporations are often seen as soul-less, grey worlds. And the same can often be said for a corporation’s communications approach; the bland press releases, the staid web-site which rarely seems to be updated. 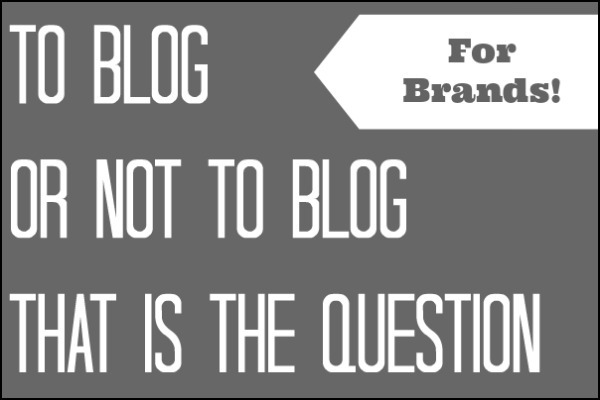 As people we all thrive on interaction and dialogue and that’s why blogs are so successful. They’re your corporation’s personal voice, a voice that need not use corporate-speak and jargon but instead adopt a tone that is more informal and conversational. Your blog will need a face. It could be the CEO or another senior person. But a blog doesn’t need to be written by an executive. Some of the most insightful blogs are written by product managers, researchers and others who are passionate enough to make what they are saying interesting. The beauty of blogging is that you don’t need to stay on message all the time. You can write about diverse topics which don’t need to be about the company. Customers will see through marketing pitches so step away from the self-promotion. Instead, offer human insights into recent events, industry news and other related information. Let your customers know more about you than just your product line-up and they’ll begin to become more loyal to your brand. Unlike many other forms of communication, blogs are there to receive feedback as well as to be a voice for the company. When you engage readers and respond to dialogue – both positive and negative – you’ll be doing much more than just promoting your company. Blogs are a great way to test the water, to understand your customers’ perception on certain issues. And even if the comments are negative, at least you’ll know what your customers are thinking and be able to respond and bring them back on board. Get talking on a blog and even those stakeholders who may not agree with your company’s strategy will appreciate your efforts to talk with and about these issues in a forum that allows for and encourages debate. 4) Drive that web traffic! Want a business reason for blogging that your sales team can measure? How about the web traffic that a blog will drive to your site. Many web engines such as Google rank sites based on content, on relevance and popularity. A blog that is updated regularly, that has content that is popular and that links to other sites you’ll find your own corporate site being ranked much higher by search engines such as Google. Once your own blogging site has become established you’ll find others linking to you, which will further propel your blog to the top of the search rankings and towards the nirvana of a first page listing. The beauty of communicating on your own site is that you can analyze your visitor statistics, to understand where your visitors are coming from, what they’re doing on your blog, what they’re using to read your blog (are they viewing your blog on a PC, a tablet or a mobile?) and how they’re reaching your site. The beauty of web analytics is that the more you have, the better you can make your blog and improve your visitor numbers. From there you can start defining your blog’s goals and measure your goal conversion, review how you’re promoting your blog and understand which topics and keywords are the most successful in driving traffic to your site. Unlike traditional public relations metrics, online measurement tools are instant and can give you a full picture of what you’re doing right and how you can improve your blogging outreach. Blogging technologies are evolving but don’t feel daunted by the technological challenge. Blogging can be simple enough to begin with, and most blogging platforms have their own in-built analytics to help you out. This entry was posted in Bahrain, Blogging, Kuwait, Oman, Qatar, Saudi Arabia, United Arab Emirates and tagged blogging, corporate communications, digital communications, Fortune 500, Inc. 500, Livejournal, middle east, social media, the Center for Marketing Research at the University of Massachusetts, tumblr, wordpress by alexofarabia. Bookmark the permalink.